Bulrush is a member of Cyperaceae or the sedge family, which consists of 4,000 species and 70 genera. Treatment varies among the species and time in the growth season. Generally, we recommend treatment later in the season as seed heads appear. Later in the season the bulrush is directing its energy to storage in its roots. Thoroughly wetting bulrush plants with Glyphosate 5.4 and a surfactant allows the herbicide to travel throughout the plant, killing both the roots and vegetative portions. Bulrush can rapidly invade bare mudflats and are good indicators of disturbance. Bulrushes reproduce with seeds and roots (sexually and vegetatively). Wind or currents to shore and shallow areas can spread bulrush plants to new areas and in rare instances in mature, natural stands. Birds may also help disperse bulrush seeds. Their most common mode of expansion is from creeping rhizomes. The creeping rootstock of underground rhizomes can quickly expand local bulrush colonies, impeding navigation and recreational benefits. Bulrush is a perennial, emergent, grass-like wetland plant often found growing in large colonies. 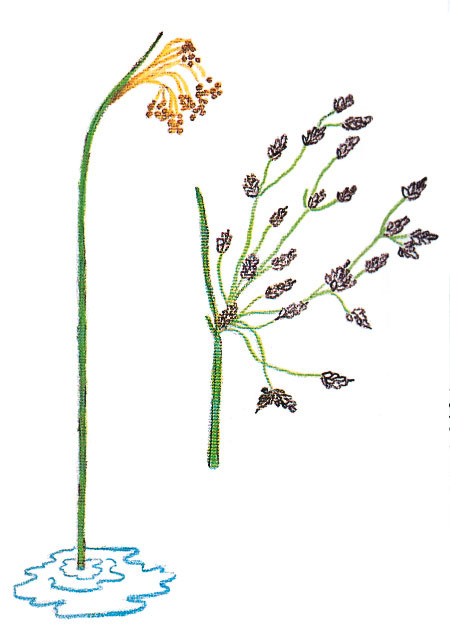 Bulrush may have a round shaped stem, often hollow, and without leaves. Bulrush also may have a triangular stem with long, slender green leaves that appear to be a continuation of the stem similar to those of grasses. Bulrush can grow 5' to 10' above the water with a cluster of small reddish brown flowers and seeds at the tip of the stem. Bulrushes are found in shallow water along shorelines up to 8' deep in Eurasia, Australia, New Zealand and North America. Some species are tolerant of brackish water, but most are freshwater species. Bulrushes are widespread, tolerating diverse salinity and temperatures. Hard stem bulrush grows in firmer sediments while soft stem bulrush growns in softer sediments. Areas with an abundance of silt (ponds, lakes, rivers, marshes, sand and gravel bars) provide ideal habitat for bulrushes. For easy bulrush control, we recommend using Glyphosate 5.4 herbicide.